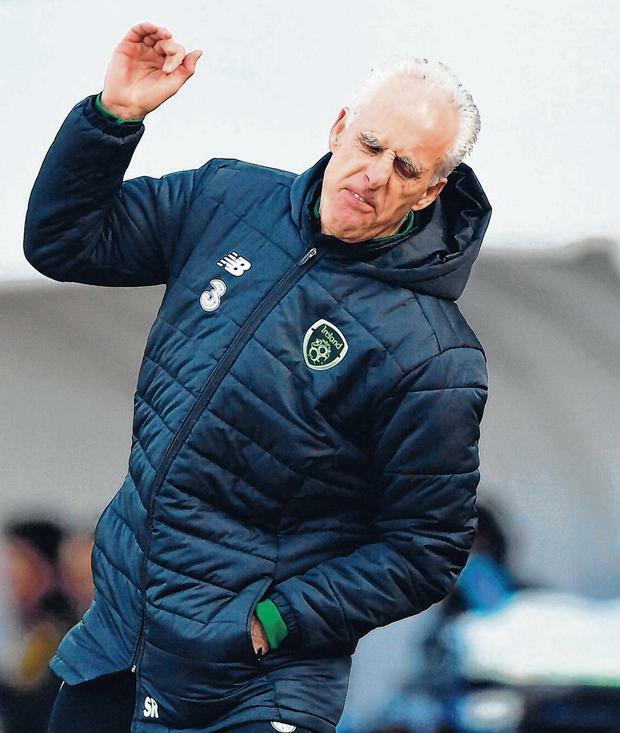 Former Ireland defender Mark Lawrenson fears Mick McCarthy faces a daunting challenge to plot a route to Euro 2020 qualification, as he suspects a lack of scoring power will undermine his efforts. Liverpool legend Lawrenson, who played 39 times for Ireland in a stellar international career, believes McCarthy will struggle to revive a side that lost its way badly under the guidance of Martin O'Neill, as he suggests goals will continue to be elusive for the Boys in Green. Last Saturday's 1-0 win against Gibraltar highlighted the lack of attacking firepower at McCarthy's disposal, with Lawrenson telling The Herald that there will no quick fix solution to Ireland's biggest problem. "It is all well and good replacing the manager and saying everything that was wrong with the team was down to Martin O'Neill and Roy Keane, but the same major issue remains - I can't see where are the goals going to come from in that Ireland team," stated Lawrenson, speaking at the launch of BT Sport film Two Tribes. "Since Robbie Keane finished, we haven't had anyone who can score goals and without goals, you won't win football matches. It doesn't matter who the manager is, the lack of cutting edge in that team is a major issue and I don't see a way around it any time soon. "I look at the squad Mick has inherited and find it hard to see how he is going to be able to get them winning and playing attractive football any time soon. "I don't think we will see too much change in the Ireland team under Mick McCarthy. We will be extremely competitive, the commitment will be there from every player, but will we see a massively improved team? I don't think so." Lawrenson went on to insist Ireland need to keep the door wide open for English-born players to pull on the green jersey, despite concerns over the policy following the defection of Declan Rice to England after he won three senior Ireland caps. English-born Lawrenson accepted an offer to play for Ireland when he was playing for Preston and that decision ultimately led to him securing a dream transfer to Liverpool. "Ireland are not in a position to say we don't want English-born players in our set-up, far from it," adds Lawro. "We need help from wherever we can get it at the moment and cannot shut the door on anyone is there is a possibility of them playing for us. "Declan Rice is a fine young player and if he doesn't want to play for Ireland, the way the rules are set up at the moment means he can do what he has done and go off to play for England. I hope FIFA change the rules now. "Personally, I was so proud to represent Ireland even though some said I'd made a mistake when I moved on to Liverpool and could maybe have been part of an England squad, I never saw it like that. "In fact, my decision to play for Ireland was crucial in me getting a move to Liverpool because they signed me on the back of my international performances. "Five of Liverpool coaching team went to one of the Ireland games to watch me play and that is when they decided I was ready to make the step up and not for one second did I regret declaring for Ireland when the offer came my way." Mark Lawrenson has contributed to the BT Sport documentary Two Tribes, looking at Mersyside football in the 1980s. It premieres on March 30 at 9:00pm on BT Sport 1.